Hi Whitney J Decor Readers! I’m Katy Byrne from DBK: Designs By Katy. Ever see a room on Pinterest you love, but think it’s something you could never pull off? Think again! Take the time to decode the major pieces and get to searching. West Elm has this incredibly similar sofa (minus the great black piping). Throw in a little Crate and Barrel, ZGallerie and Whitney J Decor Pillows, and voila! Great look. Did you know Whitney has a great little shop? Three of the pillows on the sofa are from her store. Check it out. She has great fabric choices. Thanks so much for having me Whitney! Don’t forget to stop by and visit me at Designs By Katy! 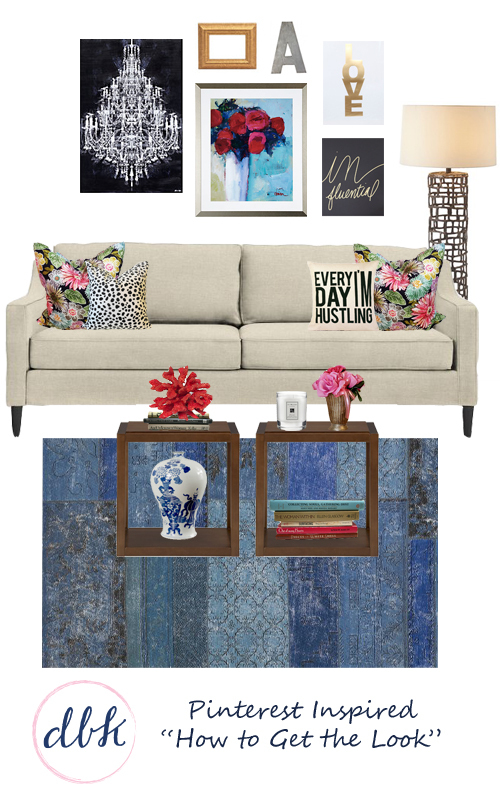 Thanks so much for dropping by and sharing your tips to get an eclectic living room. Eclectic spaces are my favorite!